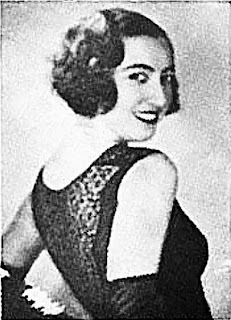 This is Kasriel Broydo's send-up of Fanny Gordon's tango Milosc cie zgubila.That's Fanny in the picture. She was the only female composer I know of working successfully in the Polish cabarets and nightclubs between the World Wars. This Yiddish version was sung in Europe by Mina Bern and Joseph Widetzky. I love how the loving couple displays behavior that must have been so aggravating to the singers: they sneak into the theater for free, they snap and crunch sunflower seeds and cookies in the front row and they even eat fruit compote and nudge around with their pal Velvl. Oh my dear Sore-Dvoshe, why are you sitting in the street looking at the moon? Oh, pardon me, I forgot: you’re still mad at me, my radiant madonna. Tell me why you’re angry at me again? Let’s make peace already. My darling, I love you, believe me. Yosl, why are you singing me a serenade? Why can’t you let a pretty girl sit in the street? We’ll go walking and I won’t be angry any more. Oh, a piece of chocolate, that’s foolishness, it only costs a zloty. And we’ll josh around with Velvele, who eats compote. Oh my love, how can I live through the minutes before I take you to the khupah? And walk with them on the avenues. What a sweet life it will be, sugar and apple kvas.